It has always been a rocky road toward peace and prosperity on the Korean Peninsula, and so far it seems this year is no exception. Following the no-deal summit in Hanoi, the U.S. Treasury Department appeared to add new sanctions relating to North Korea, to which the North responded by abruptly withdrawing its entire staff from an inter-Korean liaison office. It seems now that the two countries are carefully weighing their options, studying each side's every move. 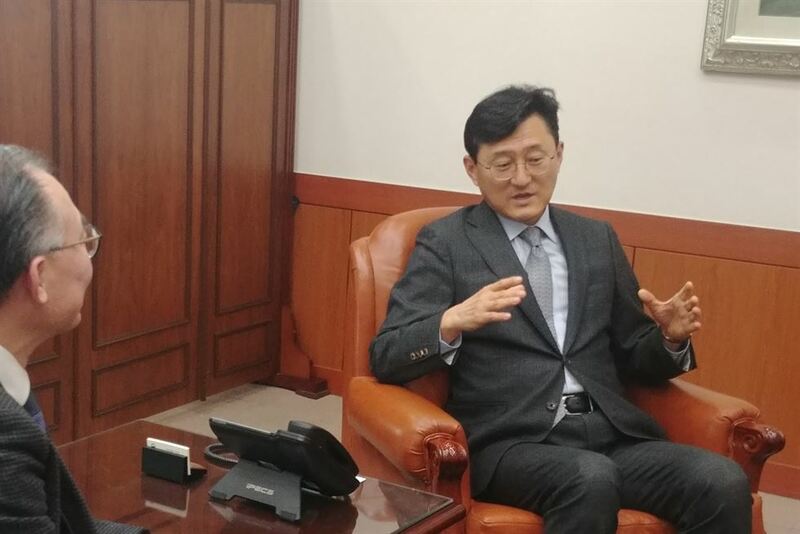 Deputy Foreign Minister Yoon Soon-gu sat with Professor Hwang Jae-ho of Hankuk University of Foreign Studies, Korea Times columnist, last Thursday to assess the present state of Korean diplomacy and discuss the way ahead. Apart from having served in some key government posts, such as ROK Ambassador to Egypt, Consul General in Washington, D.C., and Director-General of the International Policy Bureau of the Ministry of National Defense, Yoon also holds a master's degree in international affairs from the Pennsylvania State University. Q1) Starting with the Hanoi Summit, what is your assessment? I want to look on the bright side first. I believe it definitely provided an opportunity for the two leaders to better understand what is at stake for each side. This is crucial in setting up a solid foundation upon which future negotiations can take on further steps. The Korean government seeks to continue its efforts toward achieving complete denuclearization and establishing a permanent peace regime on the Korean Peninsula, with the help of the international community. In this regard, let me remind you of the 2017 U.S.-DPRK Joint Statement signed in Singapore ― at least three terms laid out in this latest statement are seeing sound progress. First, the ongoing recovery of the remains of U.S. soldiers; second, progress on U.S.-DPRK relations; third, narrowing the gap on the prospects for a lasting peace regime on the Korean Peninsula. In regards to denuclearization, the two sides are also putting up efforts to make common ground. I anticipate much better outcomes to follow. Q2) Lately, the term "facilitator" is often being used to describe South Korea's role in U.S.-DPRK relations. There have been various terms describing South Korea's role in regards to U.S.-DPRK relations. One of them, for example, was "intermediary", but some may say it seems rather odd for a U.S. ally to be "mediating" the two countries' relations in the middle. We also must not forget that South Korea is perhaps the biggest stakeholder in U.S.-DPRK relations. It is in our every interest to exert our utmost efforts to make things better between those two countries. Taking into consideration all these factors, the term "facilitator" seems like the right fit. Q3) Recently, there has been discord between South Korea and China over the fine dust problem. How would you assess Korea's current relations with China? I would assess that our relations with China have dramatically improved since President Moon's visit to China in 2017. For one thing, the sheer number of Chinese tourists, which had once been reduced over the THAAD controversy, is now on a recovery path. China is a crucial partner in our efforts toward achieving denuclearization on the Korean Peninsula, and the ROK government is in great appreciation of China's constructive role in this regard. As to the issue of fine dust, it would be most ideal for the two countries to discuss various joint actions that could be taken, such as joint research on possible solutions. This year, in recognition of the 100th anniversary since the establishment of the Shanghai Provisional Government, we seek to further expand opportunities for our mutual cooperation with China. Q4) Things have been pretty tense between South Korea and Japan lately. From a long-term standpoint, there have been ups and downs in ROK-Japan relations. There is no denying, however, that Japan is our very important neighbor and that maintaining good bilateral relations will be beneficial to both sides. For this reason, the Korean government is taking a two-track approach by distancing history issues from our two countries' substantial relations with each other. Let me point out there were approximately 7.5 million Koreans that visited Japan solely last year. Even in times of hardship, I am generally optimistic that things will get better, considering the consistent level of people-to-people and cultural exchange between the two neighboring countries. Building on this, trilateral cooperation among Korea, China and Japan will also be instrumental in Korean diplomacy. Q5) China's "Belt and Road Initiatives (BRI)" and the U.S.'s "Indo-Pacific Strategy" seem to be holding each other in check. What should South Korea do? Keeping in mind that we, as a nation, are hugely dependent on the geopolitical environment surrounding us, it is in South Korea's diplomatic, economic and national security interest to maintain a stable international system in Northeast Asia. South Korea is a small-scale liberal economy whose security and economic interests are closely interlinked with those of the international community. Any external impact on the current international system based on multilateralism and free trade will directly influence our national interest. That said, the Korean government is open to various possibilities and options that cross paths with our "New Southern Policy" and our openness to multilateral cooperation. The determining factors will be whether such options meet our national interest and whether they converge with our fundamental values, such as openness, transparency, diversity and norms-based diplomacy. Q6) How would you describe bilateral communication between Korea and the U.S., particularly given the latest outcomes of the SMA negotiations? The Special Measures Agreement(SMA), which sets forth measures related to defense cost-sharing between the two allies, has long continued since 1991, with the amount of SMA contributions consistently growing. I would say South Korea is doing what we can to substantially improve the stationing environment for the U.S. and maintain a firm combined defense posture. There were difficulties in the last round of negotiations, but the two sides have never failed to reach an agreement each and every time. I believe it is natural for any allies to go through differences in opinion; EU and NATO are no exceptions. The important thing is for them to coordinate their differences in the wisest, most harmonious and mutually beneficial way. Q7) What would you say are the most distinctive characteristics of diplomacy under the Moon administration? I would call it "a wise, confident approach" with the conventional four ― the U.S., China, Japan and Russia, as well as "diversification" of partners. The Korean government under the current administration has sought to expand smaller-region, multilateral cooperation, such as Korea-China-Japan, Korea-ASEAN and Korea-Visegrad group cooperation. We are also attempting to engage more widely with a diverse global agenda, such as peace-keeping operations (PKO) and official development assistance (ODA), and not just limiting ourselves to NK-related or economic issues. The New Southern Policy under the Moon administration is a good example of such efforts. As this year marks the 30th anniversary of the dialogue partnership between Korea and ASEAN, Korea will be hosting a special Korea-ASEAN Summit. We are also continuing constructive discussions on the establishment of an ASEAN Bureau within the Ministry of Foreign Affairs. Q8) The Korean government is making greater efforts in the area of public diplomacy as well. Today's diplomacy and diplomacy in the future should not just be restricted to government- or ministry-level exchanges. It should aim to win the hearts and minds of the public in Korea, as well as in foreign countries. For this reason, our foreign ministry is making greater efforts to expand the horizon of our diplomatic activities, by not only focusing on the conventional audience of foreign government officials and opinion leaders, but also addressing a wider spectrum of the public in a foreign nation. Our scope of diplomacy will also be widened from the capital cities of the major powers to the local villages of remote countries. We seek to make the world be better acquainted with our cultural appeal, and more deeply understand our policy initiatives based on Korea's role within the international community. Institutionally, this has been reflected by a steadily growing public diplomacy sector within the foreign ministry. Q9) Any additional comments for our readers? I want to emphasize, on a final note, that the goal of Korean diplomacy, particularly this year, will be to make our diplomatic efforts more engaged with and less distanced from the people's day-to-day lives. Our plans to further enhance mutual cooperation with China on the fine dust issue is a superb example of this. Also, I would like to underscore the importance of further strengthening our diplomatic capability. I believe there are mainly two ways in which this could be done. One is to enhance the individual capabilities through consistent diplomatic reforms toward increased work productivity. The other is further augmenting our diplomatic infrastructure, such as manpower and resources. These two factors must go hand in hand, as one without the other is like an empty shell. Bearing this in mind, our ministry is sparing no effort to harness authentic reforms and renovations through various initiatives. Hwang Jae-ho is director of the Global Security Cooperation Center, Hankuk University of Foreign Studies, Seoul. Yeo Sun-ha, a senior researcher, and Song Min-ju, a researcher at the center, assisted Professor Hwang with the article.